In this crazy busy world, our energy and time get split into a zillion different directions as we try to manage our workload, friends, families, and much needed “me” time. At some point, we come to realize that we're spreading ourselves too thin, and either through sickness or sheer exhaustion, our bodies let us know when enough is enough. How many of you can admit to falling asleep all too often as soon as your head hits the pillow, only to wake to your partner and apologize for being so exhausted? Even worse, falling asleep during an intimate moment with your loved one? Have I Ever Told You How Fabulous Yoga Is? Not only does it help improve sleep quality, relieve stress and anxiety, improve overall physical health, create a kickass body and calm, collected persona, yoga can also be an excellent energy-booster. Studies show that some yoga poses reduce fatigue and adjust the hormone cortisol—too little of which can zap your energy. Yoga engages your core and energizes your system from the inside out; it sharpens your focus and incorporates lots of deep breaths, which in turn increases your oxygen intake instantly to help you feel more alert. Most of us find ourselves fighting brain fog and tiredness with caffeine, sugary drinks, and unhealthy food choices to help us make it through the day. Then, when it’s time for lights out, we're far too wired to sleep, or worse, too distracted to focus our love and energy on our time between the sheets. Stop this vicious cycle and find a way to inject yoga into your world and bring back the energy and passion into time with your loved ones! Kick caffeine to the curb, roll out your yoga mat, and use these yoga poses as your espresso shot that stimulate the blood flow through the body to combat fatigue and boost feelings of vitality! This will leave the body and mind feeling revived and ready to take on the day! If you have time for nothing else, then try to fit in 6 to 8 rounds of Sun Salutations. There are a zillion variations, but once you get comfortable with this routine, you can add in your favorite poses (Warrior I, II, etc. )—just make sure to keep moving and keep the energy flowing! Aka the caffeine of yoga, backbends energize you by stimulating the nervous system, revving up your metabolism, and releasing adrenaline. They strengthen and lengthen every single vertebrae—increasing flexibility in the spine and reducing fatigue and stress. 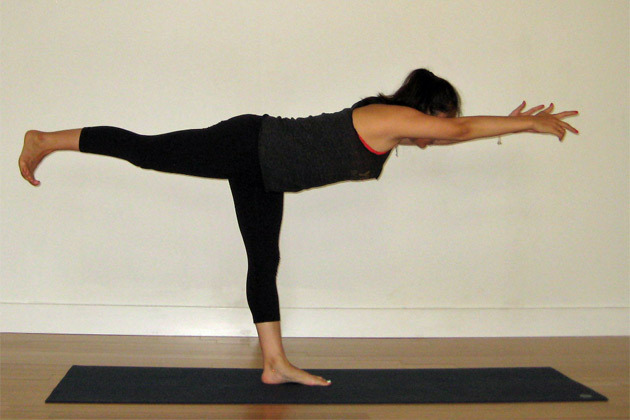 Try poses like Cobra, Bridge, Bow, or Camel, focusing on feeling every sensation in your body. When we open the back and chest, we feel more emotionally buoyant and physically energized. This is one of my favorite strength-building, kickass poses. It works your legs, shoulders, back, and abdominals. Warrior III also improves balance and posture, making it a great pose to remind you to get those shoulders back, chest open, and start your day with a confident passion for your new day. Chair will force you to stay in the present moment and focus on your breath. This is an example of your yoga practice becoming a moving meditation—and learning this in Chair Pose will help you stay present and calm in other situations throughout your day. This pose translates to ‘fierce pose’ from Sanskrit. So start your morning out with power, and feel it carry you throughout your day. From Chair, make your way into the fantastically energizing Eagle Pose, which is well known for pushing the blood flow straight to those deliciously private areas increasing your libido for the night ahead. Feel the tension melt away from your side body as you stretch into the QL muscle, feeling the release of the tissue along your oblique muscles, creating space between the ribs and easing its way through to your chest. Feel the length being created with every single inhale and exhale. 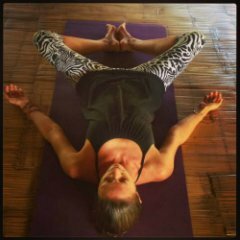 When you're finished stretching into the side of your body, inhale and lengthen your spine, then exhale, hinging forward from the hips into a fabulously delicious hip opener. 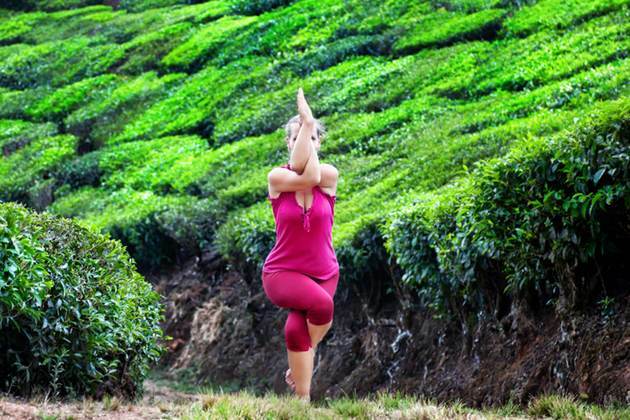 This is an awesome pose for reversing the effect of gravity by revitalizing the organs as pressure is relieved from the lower areas of our body. It stimulates the nervous, hormonal, and endocrine systems, improving our overall health, reducing fatigue, and giving us a dose of energy! Restore with this pose with a bolster or block between your shoulder blades. This will relieve tension from your hips, where we store tension from our past, and a place where we all store tension from too much sitting throughout the day. By opening up through our hips and heart, we increase the blood flow to our groin, stimulating our energy levels for fun times with our special someone later that day. Where the blood flows, the energy follows! Sometimes taking just 20 minutes to nurture yourself each day is enough to give you heaps of energy to get you through busy days. Allow yourself to find that perfect sense of Zen before reconnecting with your special someone heading into your evening together.